Members who would like to share their photos on this Web site may submit them to the Webmaster: agclem_AT_comcast.net (change the "_AT_" to "@"). 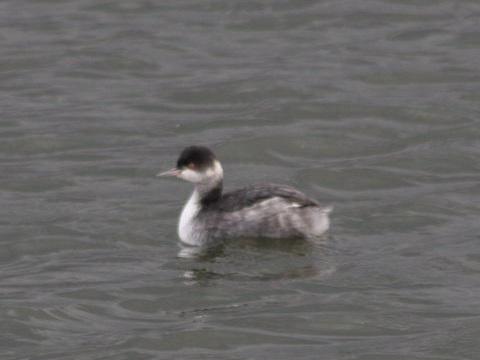 Allen Larner spotted an Eared Grebe at the Stuarts Draft Waste Water Treatment Plant on November 17, and took some photographs. The Eared Grebe is a western species that visits the Atlantic coast on rare occasions. It has been sighted in this area only three times before, most recently on October 1, 2006. UPDATE: Unfortunately, the Eared Grebe left the area almost as soon as it arrived. Here today, gone tomorrow. You snooze, you lose. Eared Grebe, photo courtesy of Allen Larner. Bird Seed Sale succeeds in spite of snow! 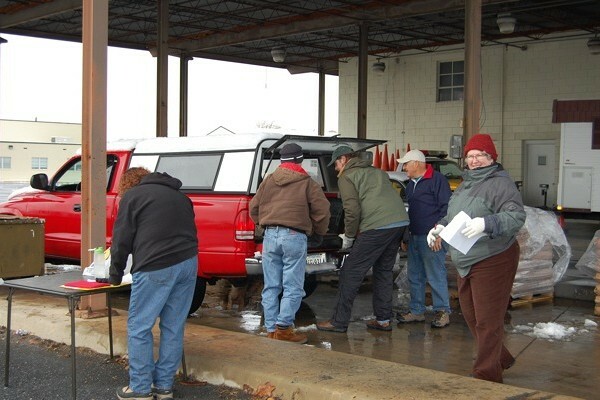 Neither cold nor snow nor fierce winds could stay the hardy volunteers of the Augusta Bird Club from their appointed rounds on Saturday, October 29, for the 2011 ABC Bird Seed Sale. Most folks picked up their purchases in the back of the Augusta County Government Center in Verona, and deliveries were made to various places around the county. In the photo below, you can even see snow on the pavement! Total volume of sales declined somewhat compared to the year before, probably reflecting the hike in prices for most seed varieties. Nevertheless, the total proceeds were satisfactory, and will be of great use in supporting club activities and causes such as Nature Camp, where youngsters from the area learn about wildlife and conservation issues. Among those who helped out with the Bird Seed Sale on October 29 were Catherine Kohus, Penny Warren, Grant Simmons, Michael Reynard, Linda Matkins, Gary Lancaster, Emily Lancaster, Crista Cabe, and Andrew Clem, who took the photo. 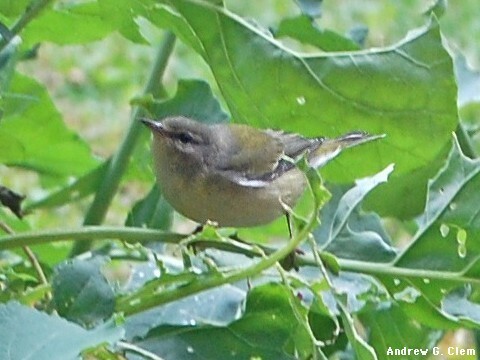 This Tennessee Warbler was photographed by Andrew Clem on November 4, unusually late in the season for this species, or just about any neotropical bird. In case you haven't stopped by the Rockfish Gap Hawk Watch lately, here is a sample of what you've been missing. The recent cold front has accelerated the pace of the hawks' migration, and there have been several thousand Broad-winged Hawks recorded on more than one day since mid-September. Hawk migration season will continue for several more weeks, so head on up to Afton Mountain and join the fun! 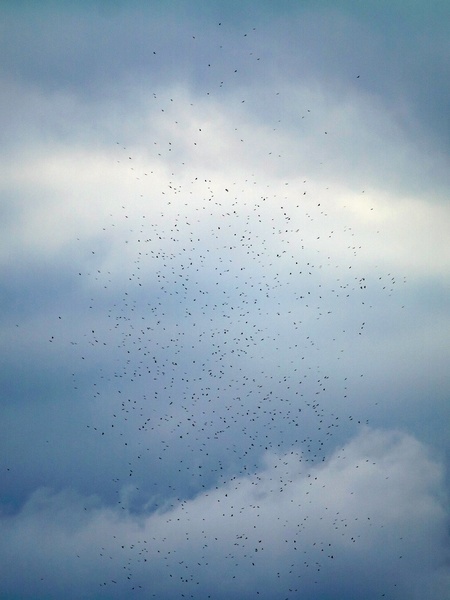 A kettle of several hundred at least 1,200 Broad-winged Hawks. Photo courtesy of Diane Lepkowski. 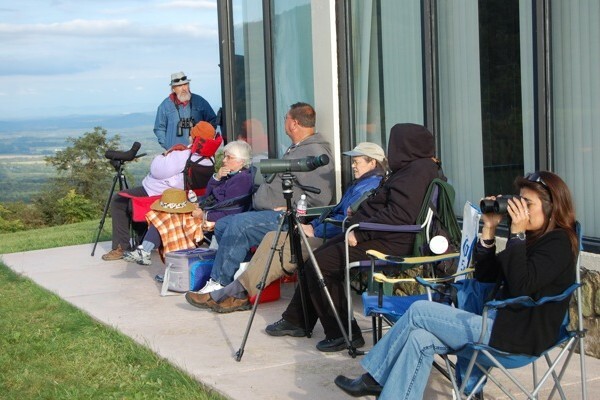 Hawk watchers at the Afton Inn, on September 17. Photo by Andrew Clem. 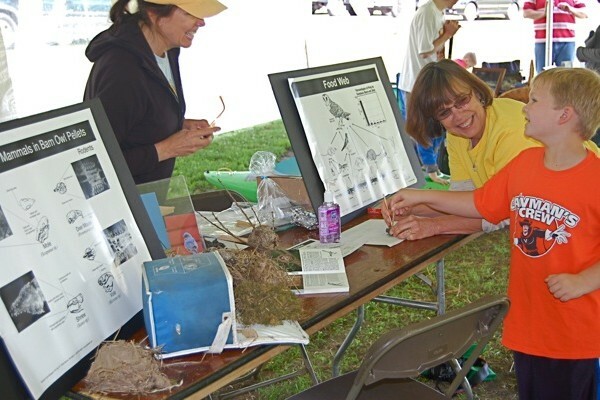 Augusta Bird Club members have been busy with a variety of endeavors in recent months, including the annual Riverfest celebration on the banks of the South River in Waynesboro, and the Annual Meeting of the Virginia Society of Ornithology, which was held in nearby Harrisonburg, May 13-15. 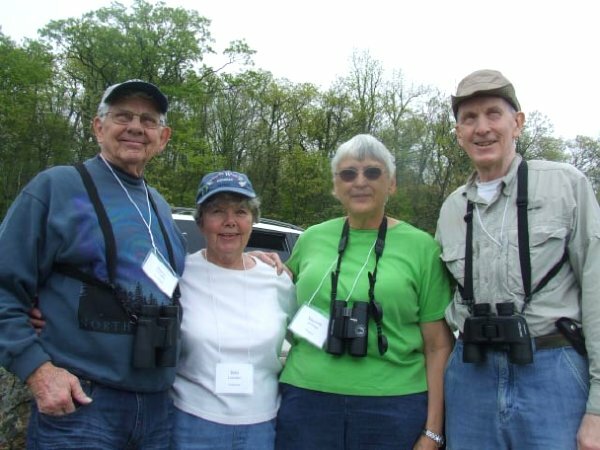 This year's VSO meeting was hosted by the Rockingham Bird Club. 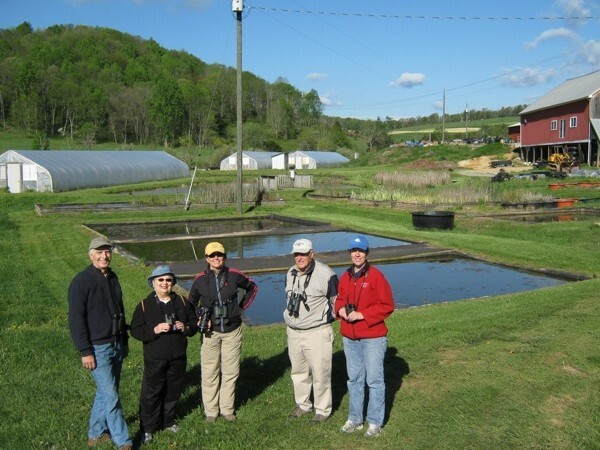 As fall gets underway, many ABC members are participating in the annual hawk watch on Afton Mountain. Brenda Tekin is coordinating that program, assisted by Vic Laubach. There will also be several field trips as the autumn migration season peaks. 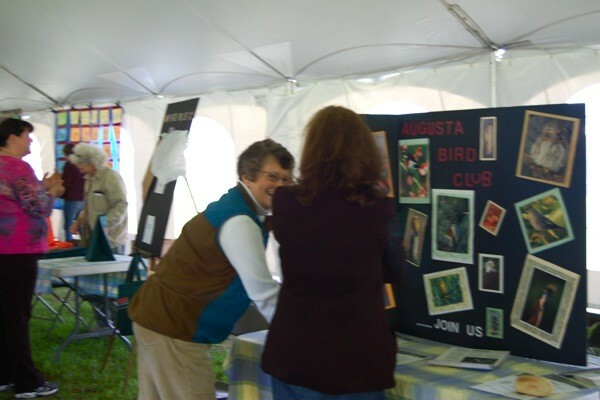 Members of Augusta Bird Club, Harry and Beth Lumadue, Marietta Beverage and Dan Perkuchin were among those who attended the Annual Meeting of the Virginia Society of Ornithology in Harrisonburg, VA.
Penny Warren and Linda Matkins at Riverfest, in Waynesboro. Lisa Hamilton and Jean Smith at Riverfest. 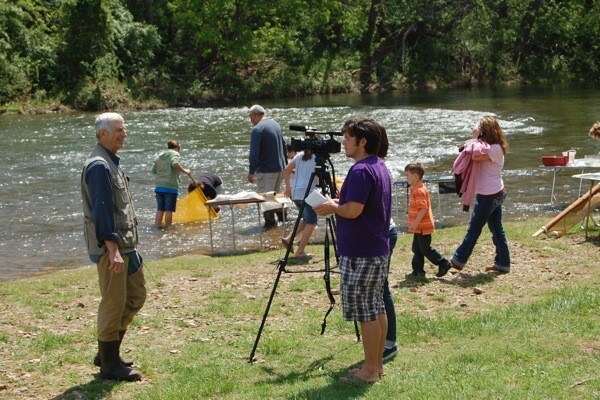 In April Penny Warren led a field trip to Springdale Water Gardens, postponed by one day due to bad weather. It is a wonderful setting with a variety of habitats that attract many different birds. ABC members at Springdale Water Gardens, near Greenville. Common Redpoll pays a rare visit! 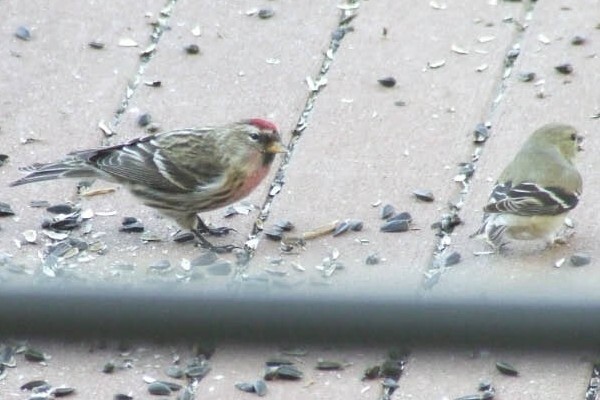 On Thursday, March 3, Beth Lumadue spotted a Common Redpoll on her balcony in Fishersville. It was a life bird for her, and according to YuLee Larner, it is the first one reported in Augusta County since 1994. Before that, this species had been seen in 1978 and 1972. Wendy Ealding told Beth that there have been reports of scattered sightings of the Common Redpoll throughout the State this winter. Common Redpoll, next to a Goldfinch. Photo by Beth Lumadue. Angela and Peter Nebel spotted and photographed what they believe to be a juvenile Trumpeter Swan in the quarry near the Wendy's at the Fishersville exit off Interstate 64. 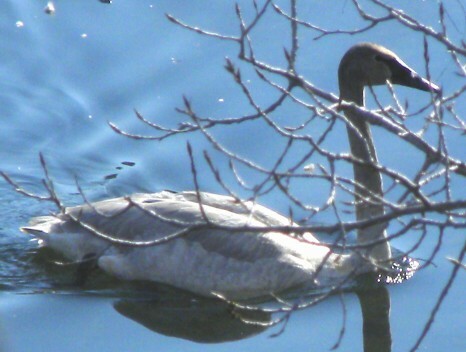 It would be only the second time a Trumpeter Swan has been reported in Augusta County. The first time was December 2000 - January 2001, in the same general location, according to Birds of Augusta County. The photos below might help confirm this sighting for sure. The bird lacks the yellow markings in the bill which are characteristic of most Tundra Swans, which is the other possibility. Angela and Peter also saw a female Common Merganser at the same location, another rarity for this region. 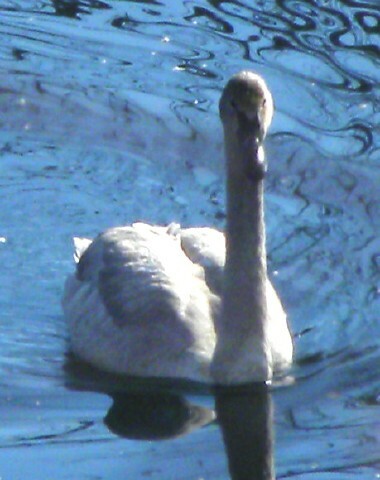 UPDATE: It is now generally agreed that this bird is in fact a Trumpeter Swan. It was last reported by Allen Larner at Hestons Farm Ponds, near Stuarts Draft, on March 2. Trumpeter Swan. Photos by Peter Nebel. Augusta Bird Club © 2019 (Photographs are used with permission and should not be downloaded without first getting permission. Please contact the Web master.